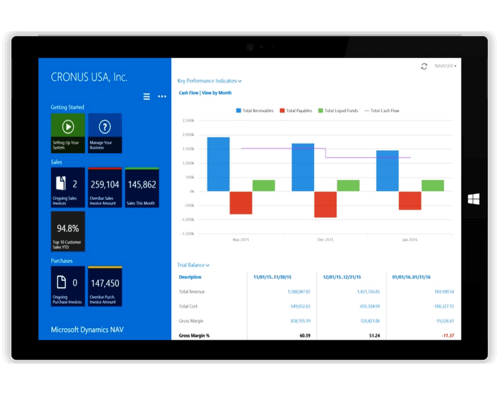 Microsoft Dynamics NAVISION ( Microsoft Dynamics ERP) software gives your people the tools they need to connect and manage your entire business, from financial and supply chain management and from manufacturing to operations, with the insight you need to make smart decisions. Start with what you need now and easily adapt as your needs change. 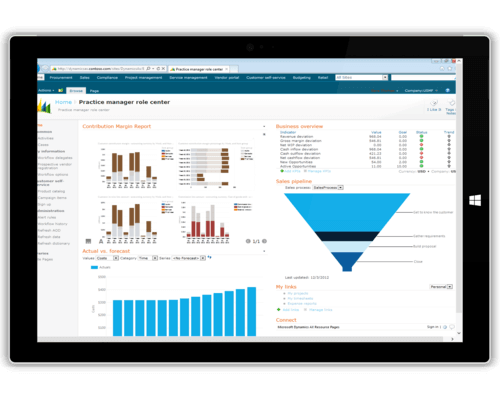 Microsoft Dynamics NAV is quick to implement, easy-to-use enterprise resource planning (ERP) software that helps more than 100,000 companies worldwide manage their accounting and finances, supply chain, and operations. It's part of a complete solution for business from Microsoft that helps you work and grow efficiently. Start with what you need now, and easily adapt as your business needs change. Microsoft Dynamics AX is an ERP solution for larger / multi-site, international enterprises. With comprehensive capabilities for financial, human resources, and operations management, in addition to industry capabilities for retailers, manufacturers, service industries, and public sector organizations, it provides the agility you need to expand business opportunities, modify processes, and differentiate your business. Compusoft provides comprehensive post-implementation support services of Microsoft Dynamics so that you can focus more on your business and less on software maintenance. Compusoft provides Regular Annual Support along with Microsoft and also offers extended support services to take care of all your post implementation needs. With expertise & experience in Microsoft Dynamics NAVISION – ERP Software | AX | CRM since 2006, Compusoft has a successful track record of providing implementation & post implementation support. Compusoft has a customer focussed mindset and can be a reliable & trusted IT partner for your IT initiatives. This software meet this requirement of business solutions companies. Compusoft is one-stop-shop for all needs relating to Microsoft Dynamics. Apart from implementation services, Compusoft can provide post implementation support comprehensively – be it regular annual support, enhancements, new development, integration, upgrades, training or any other special services. Microsoft Dynamics is at its best if it is integrated with other Microsoft products that such as Microsoft Office, Microsoft SQL, Power Pivot, Office 365, Windows Server, Azure SharePoint etc. Compusoft being a Partner of Microsoft to implement these products but also to integrate them effectively with Microsoft Dynamics. Compusoft is also a member of leading national & global associations like CRMPACT, ISODA and IAMCP. Compusoft, by its capability can support customers across India or Asia Pacific. For other regions, Compusoft can collaborate with these associations to provide you reliable onsite support. Compusoft strongly believes in offering world class solutions to its customers at an affordable price; and by making planned & continuous improvements to our Products & services, Processes & People. By choosing Compusoft, your gain significant savings in your Total Cost of IT. Microsoft Dynamics 365 Apps that work together seamlessly in the cloud.Cloud solutions available for Microsoft Dynamics 365 for Manufacturing, Retail, Finance and Operations. Customers can migrate or migrate or upgrade to dynamics 365. We have successfully implemented Microsoft Dynamic ERP for our customers and continue to support them post implementation. We are their single point of contact for for their IT & Software needs.